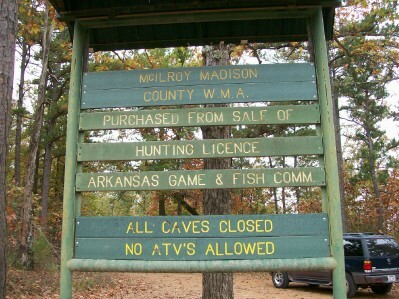 The purpose of my expedition into the McIlroy-Madison County Wildlife Management Area was to investigate Keg Hollow. 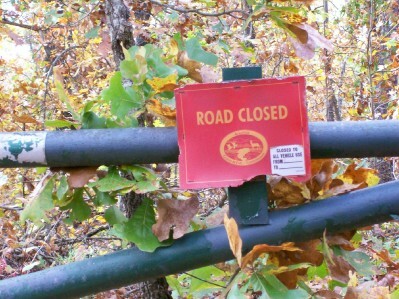 This is a good time of the year to explore some of the unimproved roads of the WMA because they are locked away behind gates 8 months out of the year. The WMA designated Road 6a takes one into Keg Hollow and it follows streams and the natural contours of the hillside as it drops down about 400 feet in elevation to the bottom of the hollow, where its cumulative waters drain into Rockhouse Creek. 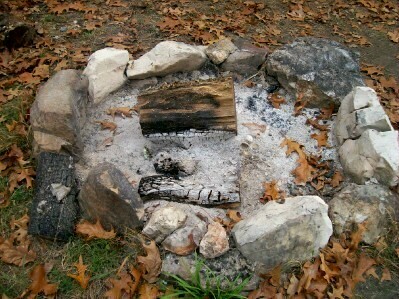 Despite not seeing another human being in Keg Hollow, I did see signs of recent activity. 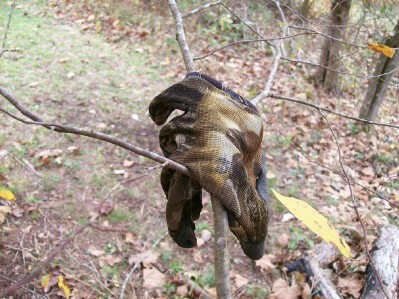 Besides the tire tracks in the muddy road, I ran across a smoldering fire and a glove hanging from sapling limbs. 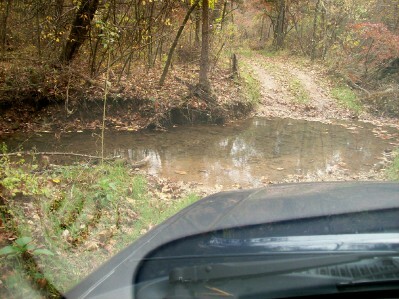 The creek beds were mostly dry when first dropping down into Keg Hollow, but after a ways there is a sizeable spring next to the road. After that, the creek beds appeared to hold water year around, at least it seemed to me that is what all the minnows indicated. When I tromped over to where the spring flowed out of the hillside, I scared some creature in the water. At first I thought it was a pale salamander, but it may have been a grayish crawdad the way it darted. Then, gazing down into the small pool of water, waiting for movement, I saw what obviously was the tail of a salamander sticking out. Well, maybe it was the tail of a snake. I was sure it was one or the other. I watched a long time waiting for the tail to twitch but the creature stayed completely still. Finally, I got a long twig to scare the little thing so I could identify it. I felt foolish to discover it was a plant root, not a tail. Though Road 6a is marked as unimproved on the map, any car could easily use most of it, the road is that good. 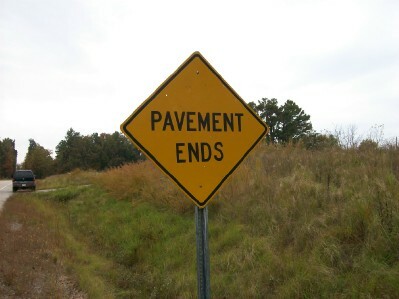 In fact, most of it is a better, smoother road than the little road into our hollow. 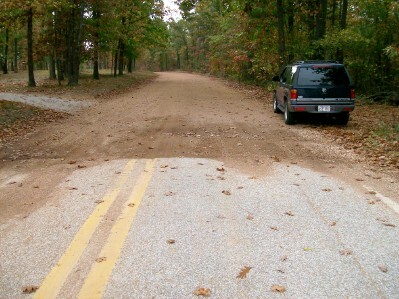 But there are some sections of the Keg Hollow road that would be a challenge for 2-wheel drive vehicles. As with much of the forested land around here, Keg Hollow still showed plenty of damage from the 2009 ice storm. I’ve heard it said more than once that it’ll take trees at least 20 years to recover from the destruction of that winter. 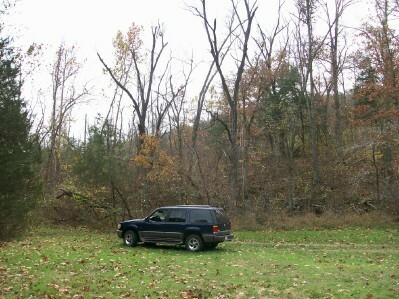 After crossing Rockhouse Creek, the road actually leaves Keg Hollow and climbs the steep facing hillside. I looked back for a last glimpse down through the trees to where the creeks merged. As the crow flies, it is exactly 5.5 miles from the hollow to the northern border of the McIlroy-Madison County Wildlife Management Area. 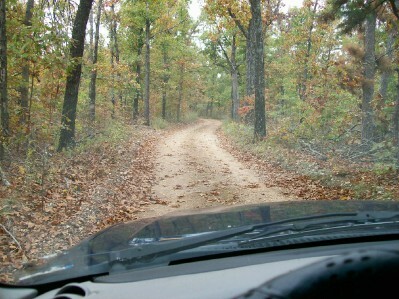 This nearly 23 square miles of forested hills and hollows is managed by the Arkansas Game and Fish Commission and is home to an abundance of Ozark interior highland species – everything from rare salamanders to the always popular big game animals. I’ve heard that even elk are seen on occasion. Arkansas started buying land here in 1957 under the leadership of Governor Faubus, and much of it was apparently owned by the wealthy McIlroy family. 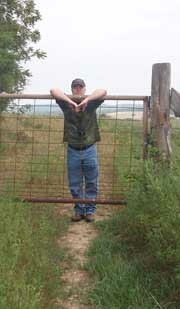 I have a 1972 USGS map that shows the name of this preserve to be the McIlroy State Game Management Area. 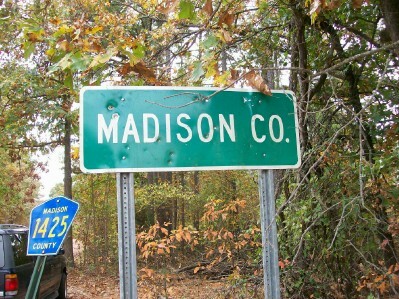 Sometime later the name was changed to the Madison County Wildlife Management Area, and then in 2008 it again was renamed McIlroy. Interesting. When I was a kid we’d count the number of stripes on our sneakers and that would indicate how fast those shoes were – the more stripes the faster you’d run. Following that logic, this is a fast snake. 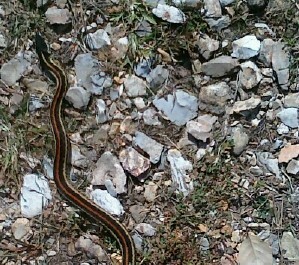 I nearly ran over this lovely creature on our little road yesterday. The 3500 pound all-wheel drive vehicle didn’t cause it to move, but when I stepped out to engage in some portrait photography, this snake was as quick as its stripes indicated. The book says that female Western Ribbon Snakes are bigger than males, but the males have longer tails. 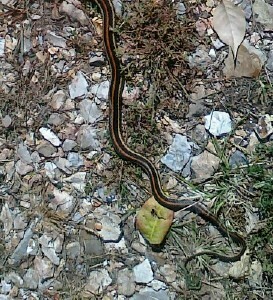 If you can look at this snake and tell whether it is male or female by the length of the tail, let me know. 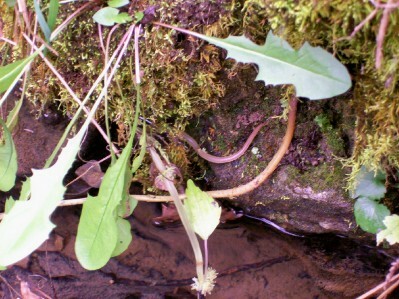 These snakes hunt around water, and particularly like larval salamanders. 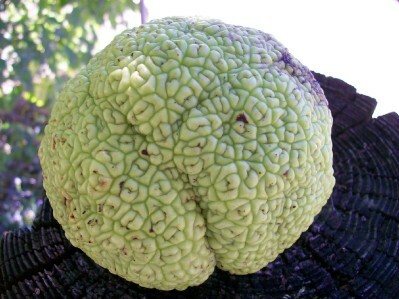 This thing is called an Osage-orange in the tree guide put out by the Arkansas Forestry Commission. I’ve also heard it called a hedge apple, a mock orange and a bois d’arc. 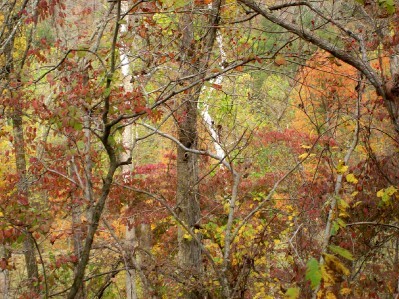 We have these trees around here in the Ozarks but I don’t know of any I could point you to. 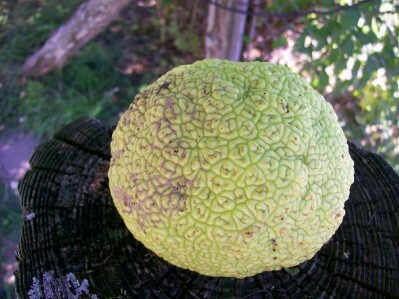 This Osage-orange I picked up in Kansas, where it isn’t native, but saw them by the thousands. Impressive.